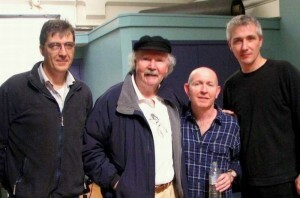 There are times in life when you get to meet legends in the music world, Tom Paxton is one of those legends. Shane got to meet Tom over a two day period when they were rehearsing for the Kieran Goss all star concert in the Belfast Opera House. Tom was a pure gentleman and a true professional. I learnt so much just talking to him and watching him sing from the wings on the Belfast Opera House stage. In describing Tom Paxton one could use many words but down to earth and an easy going guy seem to do it best. Tom sang some of his big hits on stage and the audience loved it. I have to say for me meeting him was amazing and his work ethic and his attention to detail are amazing. 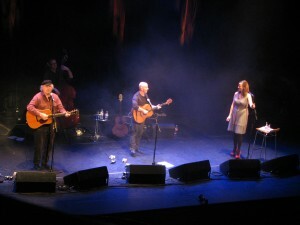 Kieran Goss and Anne Kinsella were on stage with Tom and the sound they had was amazing two guitars and three voices with double bass filled the opera house in Belfast. Kieran was great he had invited Tom over to join him on stage for this night and just hanging out with them during rehearsals and backstage was fantastic. You had Maura O Connell, The 4 of Us , Eddie reader, Kieran Goss ,Tom Paxton and there was Shane in the middle of them all. It was great to see Maurice and Shane working well together.